1 – Fact: You actually burn more calories when you work out during the winter because your body has to work harder to stay warm. However, this might not help you much in Phoenix in the middle of the day, but it is still cold enough in early morning or when the sun goes down to go out and use this to your advantage. 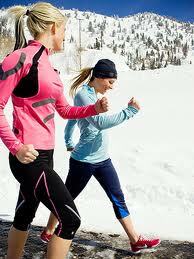 Simply by getting out into the cooler weather is a good place to start. 2 – Hydrate: Just because it’s no longer so hot that the second you step out the door you start sweating doesn’t mean you can’t easily get dehydrated. Drinking at least eight ounces of water is recommended every day. 3 – Bright Colors: It gets darker earlier this time of the year so if you are out late at night and it starts getting darker you want to make sure to wear vivid hues so that you are safe and visible. Besides, it doesn’t hurt to wear bright colors, brights are in this season. 4 – Swimsuit Season: It is only a few short months away. If you want to work on getting a bikini-ready stomach it’s best to start now. The abdominal portion of P90x is an effective way to reach that goal. As a forewarning, it is a rigorous exercise so you will need to work on your endurance. Try starting out with what you are able to do and work up to being able to finish the entire exercise. The P90x abdominal portion can be found here. 5 – Routines: Plan a routine and stick with it. You won’t be able to see results if you workout sporadically. Find the times you won’t be too tired and have enough free time to complete an effective workout.